25 red LED lights that can flash messages. Two programmable buttons (A and B) that can be used to tell the micro:bit when to start and stop things. A thermistor to measure the temperature. A light sensor to measure the change in light. A magnetometer to tell you which direction you’re heading in. A radio and a Bluetooth Low Energy connection to interact with other devices. Now you will create your first micro:bit program; after that, well we’ve listed a few ideas but it’s really up to you. 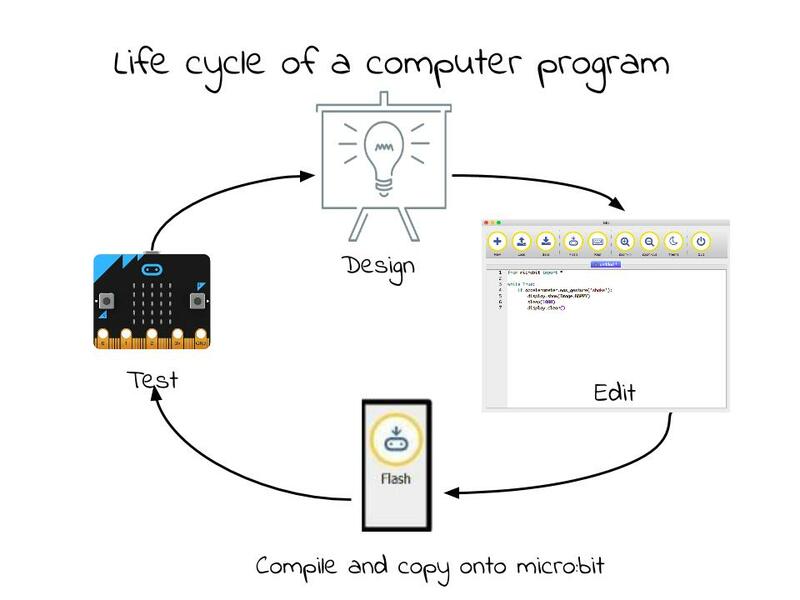 Coding using the micro:bit is composed of these 4 steps. You can expect to go around the loop quite a few times before you get your code working. You might be wondering why we’ve asked the micro:bit to sleep for 2000! This value is in microseconds so we’ve really only asked it to sleep for 2 seconds. That will give us enough time to see the image before the micro:bit starts all over again. You should see the message and the image displayed on the micro:bit and the message “Hello There! !” should be printed on the REPL. Change the text that is displayed on the screen and make it scroll across the LED display. You can do this by changing the word show to scroll. Don’t forget to save your program and remember to flash the new code to the micro:bit. You have written your first program. Carry on and see what else you can do with the micro:bit.